The General Ship Repair Corporation, a fixture on the Baltimore, Maryland waterfront for nearly a century since its founding by Charles “Buck” Lynch in 1924, has become the de facto ‘go to’ for workboat repair in the Baltimore area and is enjoying a strong year, investing in its people and employees while bringing the fourth generation of Lynch’s up through the ranks. Five years after its start, in 1929, Buck Lynch moved the company across the harbor to its current location, eventually watching the company sink into bankruptcy as the Depression took hold of the country. 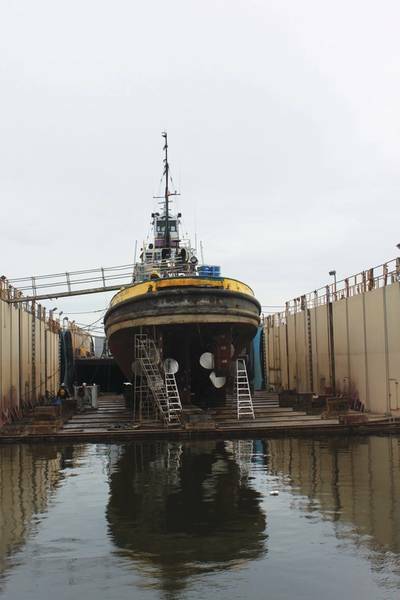 The Lynch spirit – still evident in the crew running the shipyard today – saw Buck buy the company back out of bankruptcy, setting it on course to weather good times and bad over its more than 90 years of business. In its time, the company has serviced schooners and steamships, paddle wheelers and super tankers, and everything in between. Today though, providing repair and maintenance service to the regional workboat market with its pair of 1,000 ton floating docks is the heart and soul of its business. Today the company is owned and operated by a trio of Lynch brothers: Charles F. “Derick” Lynch, Cary B. Lynch and Michael Lynch, who took over from their father Charles “Jack” Lynch in the early 1990s. In the management wings are two of Derick’s sons, Charles (Chaz) Lynch and Ryan Lynch. Chaz Lynch served in the U.S. Coast Guard for four years before deciding that his fate was on the waterfront shop his great grandfather pioneered. Mid-stream in his USCG stint he switched to the mechanical side of the operation. “He called me two years in and said that he really wanted to come back and work at the shipyard,” said Derick Lynch. “And I told him ‘you’re a deckie … I don’t need a deckie, I need a machinist.” Today Chaz serves the company as a foreman and machinist. Ryan Lynch graduated from the United States Merchant Marine Academy, and today works in the yard part-time as a project manager, working for the moment in between his sailing at-sea obligations. The General Ship Repair Corporation’s inclusion in the MN100 is based on equal parts of longevity, ingenuity and perseverance. ‘Self-Sufficient’ is perhaps the best term to describe the yard, its management and its team of 45, a focused group available 24/7/365 to its workboat clients that depend on it to keep its equipment functional and in the water earning money. Serving as the tug and barge repair facility in the Port of Baltimore, its experience with the maintenance and repairs of tugboats and barges is extensive. General Ship Repair operates its own floating equipment, trucks and portable equipment, and are able to service a vessel during cargo operations, at anchorage or at its own facility. Central to its success today is its pair of 1000-ton floating drydocks, the second added in 2012 replacing a smaller 350-ton unit.